Ever been somewhere and feel there's something very important you have to do? Maybe it's fishing or scuba diving or nothing at all. The subtropical ambiance of the Kon Tiki Resort is that kind of place. 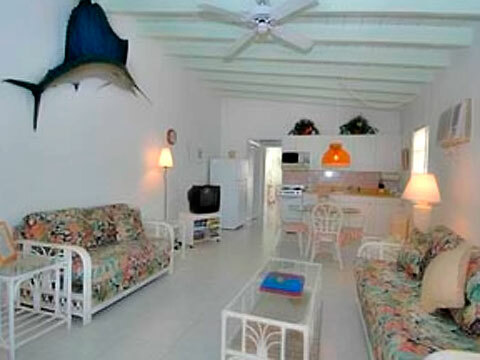 You can enjoy swimming, fishing, diving, snorkeling and boating all year round. Abundant wildlife in a subtropical waterfront setting makes a great family picnic. You'll be in paradise while soaking up the sun next to our heated freshwater pool or on the sandy beach of our private lagoon. Named for the Kon Tiki expedition, our sign is fashioned after the sail on the famous balsa wood raft that crossed the seas many years ago. Alot has changed at Kon Tiki over the last thirty-six years, but one thing stays the same: we're a great place to begin and end your Florida Keys adventure, even if you get no further than one of our hammocks. You can enjoy swimming, fishing, diving, snorkeling and boating all year round. Lush tropical landscape can be enjoyed throughout the property. For those guests who bring their boat, our deep-water dockage and boat ramp is right on Florida Bay. Relax in our freshwater, heated pool or beside our private grotto that is stocked with game fish, tarpon and tropical fish. We invite our guests to swim with these friendly fish, feed them or take pictures but you can't fish for our fish. Boat Ramp Dockage Heated Freshwater Pool open 7am - 10pm Daily Private Lagoon Grill and Picnic Areas located by the beach Cable TV Many Restaurants Nearby Excitement is never far, after all, the Kon Tiki Resort is located in Islamorada, the sport fishing capital of the world. We're just steps away from Worldwide Sportsman and only one-hour south of Miami.